Work Hard and Get Nothing: Would You Still Do It? “You’re not entitled to the fruit of your labor,” the words jumped at me from the page, menacing in the meaning they formed between their curlicues and empty spaces. What? The idea struck me as totally absurd. Why would I not be entitled to the fruit of my labor? Who was to steal the fruit of my labor? Floored. My head began to spin and was grasping inside my brain for the meaning of that phrase. I had to sit down. We all have goals. We’re told that goals in life are good. And it’s what we should do. Have goals. Lots of goals. And in a way “they” (that faceless and immense “they” we like to throw all our ills upon) are right. Goals are good to have. They help propel us forward. 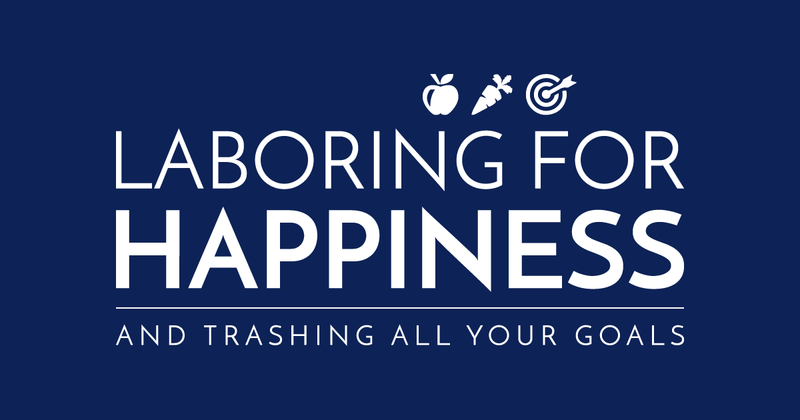 But having goals (or meeting your goals) is NOT happiness. Goals don’t offer happiness in and of themselves. Goals may help lead to happiness, but your goals are NOT your happiness! The problem is that in our society goals have become the end-all be-all of our existence. You are the sum of your goals. And you’re only as “good” (whatever that means) as the goals you achieve. But you see, society seems to be forgetting that, in fact, it’s not the goal that matters. The goal is only the carrot. What matters are the experiences we have (the friendships we build, the adventures we live, the discoveries we make) while following the path of the goal. While striving for our goal. Whether we actually achieve that goal or not, whether we get “rewarded” for following that carrot to the end, is irrelevant. And goals change because people change. You may have had set your eyes on a particular little carrot yesterday only to wake up today and find it looking sort of, well, uninteresting or unattractive. Rotten. Spoiled. Meh. Whatever. Are you obliged to keep going after that carrot-goal? Nope! Goals Are Not Your Kingdom. They’re a Camp Filled With Lunatics Waiting to Kill You. A quote bequeathed to us from the ancient Greeks through the adventures of the great hero Odysseus who was trying to return home to Ithaca after the Trojan war. But it wasn’t Ithaca that made the hero’s journey, and the subsequent poem, epic. It was the hero’s adventure, discoveries, and self-knowledge gained on the way to his goal that created the epicness. In fact, when Odysseus got home? Ithaca was nothing like he had expected. Forget about a peaceful kingdom waiting to welcome its king with open arms. Odysseus found NO such fruit of his labors back home. Instead, he found a hostile camp overrun by zealous warriors vying to marry his wife and trying to kill him, all the while eating and drinking him out of house and home. How’s that for a rotten carrot as the reward of your labors? But how many of us truly think about the journey to our goals as our true reward? How many of us honor that journey, enjoy it, and rejoice in nothing but the journey? Yes, I’m talking about that hard, difficult, uphill journey you take every day. That journey that makes you sweat from the back of your knees and fall flat on your face. But at the same time, the very journey that gives your life a purpose. When was the last time you enjoyed that? The last you did something just for that? The trouble with goals is that they focus our attention on the reward at the end. We live our lives not for the experience of living, but in the hope that we’ll gain something. Something that we probably don’t want because we never stopped to think about it. Or that we won’t want because the journey on the way to getting us changed in profound and radical ways. But society said we should have it. So we all we can think is having it. Have it or be unhappy. Some of us, for example, may have a goal of making a million bucks. A goal of becoming the best in our field. A goal of owning a yacht. A goal of buying that dream house. We “love” the goal but hate the journey. We walk the path with our eyes closed. We “grind” our daily lives down to the bone. We live and work for the promised fruit of our labor. Promised by others. Promised by society. Promised by our own imagination. We imagine ourselves earning that fruit, owning that fruit, enjoying that fruit. We can see everything! Everything but the truth: the labor is the fruit. There is no other fruit. Neither to be had nor to be earned nor enjoyed. If you’re laboring your life away only for the promise of a fruit, stop right now! If you’re doing your work only because you want a million bucks in the bank, stop right now. Hey, money is good. And a million bucks is great. But if you’re hating every minute of your life while getting there, stop right now. There are no guarantees that you’ll ever amass that million bucks. Because a million things could (and probably will) go “wrong” on the journey there. And even if you manage to amass that fortune, what good will it do you if you work yourself to the grave getting there? Working hard doesn’t entitle you to any rewards. Working hard entitles you only to the joys of your work. So if you don’t enjoy the labor, stop right now. Ask yourself who you really are and what you love. Ask yourself what matters. Ask why you’re after that goal. Rewards, recognition, validation, (golden) fruits—all those are nice when they come. But only that: nice. They’re neither happiness, nor purpose, nor fulfillment. Just nice. The real happiness and joy in life? Comes from doing labor you love and enjoy and consider important.